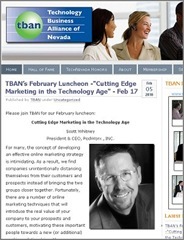 The folks at the Technology Business Alliance of Nevada have asked me to deliver my “Cutting Edge Marketing in the Technology Age” presentation. It’ll take place next Wednesday, February 17th, at the Bali Hai Golf Club’s Cili Restaurant. It’s open to all folks and costs $35 pre-paid, $45 at the door. For many, the concept of developing an effective online marketing strategy is intimidating. As a result, we find companies unintentionally distancing themselves from their customers and prospects instead of bringing the two groups closer together. Fortunately, there are a number of online marketing techniques that will introduce the real value of your company to your prospects and customers, motivating these important people towards a new (or additional) working relationship with your organization. This presentation offers those techniques. You will learn new methods to reach out and grab additional business. Be prepared to take notes! This is a very well received presentation as it delivers tips that can be immediately implemented. If you’re a Las Vegas local, and you’re responsible for the effectiveness of your website, come take a listen. Be assured that a podcast can improve sales. I know this to be true because the first podcast I produced improved the company’s web-based sales by 23%. We did this by providing a show that gave the listener what they wanted while at the same time providing a call-to-action that didn’t feel “salesy”. Within weeks we were seeing sales directly related to the podcast. Pitch, pitch, pitch. In my profession, I listen to a lot of podcasts. And many of the corporate podcasts I’ve reviewed since August of 2005 have failed to meet the criteria your listeners have for every podcast…that is, to either be entertained or educated (or both). Instead, these podcast were almost assuredly written by the folks in marketing who wanted to list all their features and how great their product is and why you should buy. This, I’m afraid, doesn’t get the job done. Remember, telling is not selling…teaching is. If you are educating your listeners, you are helping them discover on their own why doing business with you might be a good idea. Has your podcast helped your sales? Let us know and we’ll spread the word on what works and what doesn’t. We are able to deliver information about our services and solutions to our customers, prospective customers, partners, vendors ubiquitously – on their PCs, in their offices, on their MP3 players, in their car stereo system or their living room, etc. They can take it and use it whenever they want, wherever they want without having to sit and read about it on our website or our marketing materials. This is a HUGE value.